Who says pirates never do anything for their community? 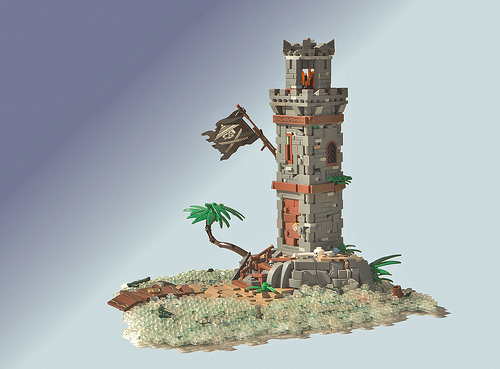 This lighthouse on a tiny island by William Navarre is by far not the first time the concept is represented with LEGO bricks and I can guarantee it will not be the last — lonely lighthouses of all styles and sizes are an evergreen theme with a lot of expressive value, so it is no surprise one pops up every now and again. What distinguishes William’s build from others is a mix of simplicity and complexity. His signature highly detailed style with intense textures is obviously apparent not only within the lighthouse’s walls and the rock below it, but also the sea and the small dock. Still, the overall design of the building remains simple, which diverts attention to more important segments. There seems to be just enough vegetation on the island so we can know it is indeed a natural island, but not too much to make it nicer than a pirate would deserve. Using natural sunlight for photography can be a risky move, but William has managed to pull it off well, additionally facilitated by the digitally added background.